Saturday at the UK Games Expo was notably busier from the outset, with lots of families making the trip now that the weekend had arrived. The Pegasus Spiele stand seemed especially family-friendly, with lots of young families enjoying the many oversized demo games set out for them including Camel Up, Yeti and Reiner Knizia cat-and-mouse game Mmm! which was recently nominated for the Kinderspiel des Jahres. 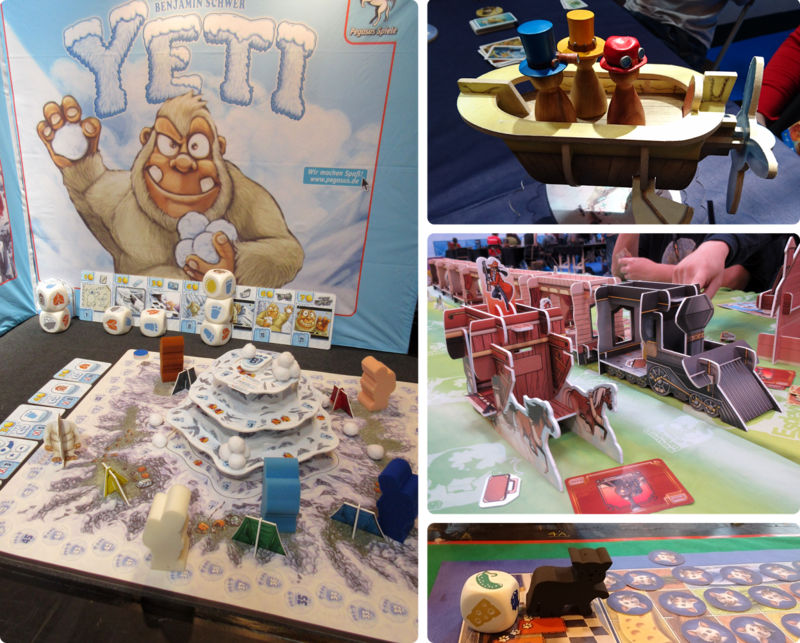 The rest of the show wasn't short on giant demo games either - I spotted Pandemic, Castle Panic, Celestia and Colt Express and I'm sure there are lots more that I've forgotten! Family provision at the Expo was great all round, so I can't wait for my little one to be old enough to appreciate it. There was a large dedicated Family Zone in the hall where popular games were laid out for younger people to enjoy, including the Expo-launched penguin-flicking dexterity game Ice Cool from Brain Games. 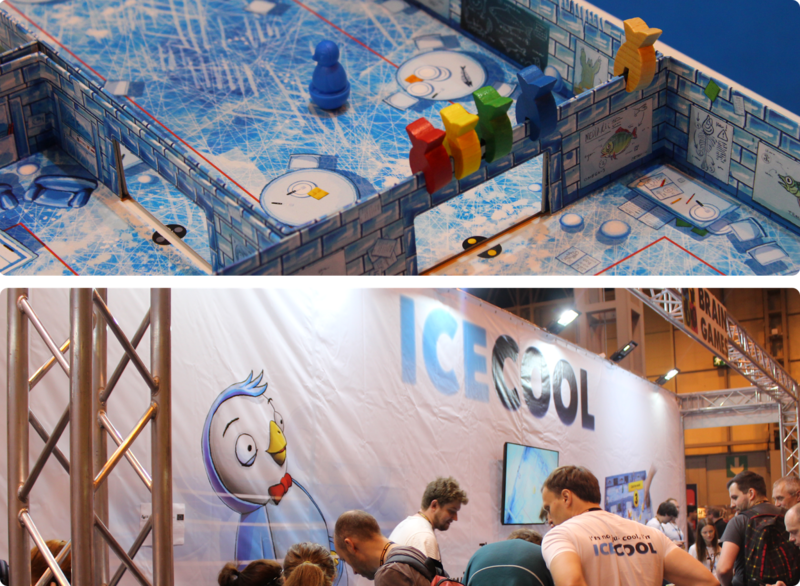 We had a quick go at this on the main Ice Cool stand, where I soon confirmed that my gaming skills don't align too well with penguin subbuteo! The game takes place in a chilly-looking school for penguins, where you've decided to sneak out of class early and find yourself some colourful fish. The only problem is, the pesky hall monitor is out to catch you and spoil all your fun. Each round, one player is the hall monitor and the rest are trying not to get caught. You move around the school by flicking your weebly-penguin character, trying to get them through doors to gain the fish of your colour above the door. The hall monitor is trying to 'tag' everyone else and steal their ID cards. Victory points are earned for fish and ID cards, including your own if you manage not to get caught. You play as many rounds as there are players, with each person taking a turn to be hall monitor. We also visited the Happy Otter Gaming stand, where I was kindly given a copy of their recent Kickstarter game Creature College, designed by Orhan Ertughrul, to review. Described as a game about dragons, talking trees, were-gerbils, ninjas, teddy bears and really big guns, I'm not sure what I'm in for yet but it looks fun! You win the game by gathering the most victory points, earned by collecting creatures, completing missions, building a research lab, and battling your opponents' creatures. There also appears to be a 50ft killer guinea pig named Kevin to fight. I'll let you know how that goes soon! The art and components are definitely lovely, so I look forward to trying it out. 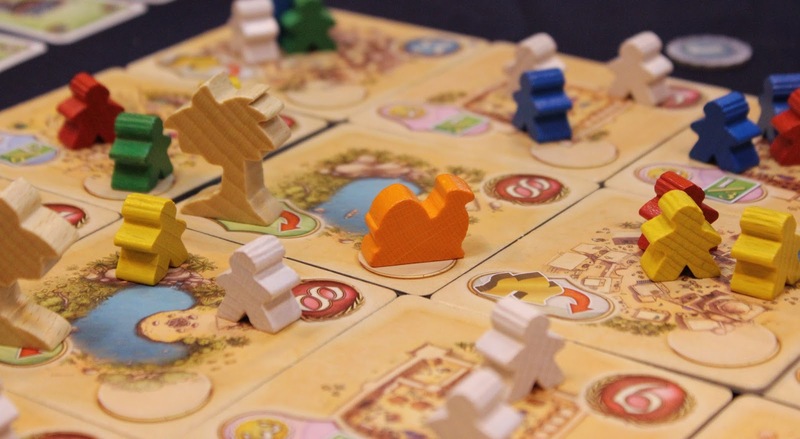 Next up, we tried out Five Tribes. This was a 2014 release from Days of Wonder designed by Bruno Cathala and I've been meaning to play it since watching the Shut Up & Sit Down review because it split their opinion so much. It turns out that I loved it - so much so that I spent the rest of the expo looking for a copy! Wandering past the Czech Games Edition stand, I thought I'd go and say hello to Paul Grogan of Gaming Rules! and apologise for Friday's non-recognition faux pas (as highlighted to me by Twitter). I'd since watched a couple of his videos and listened to the recent podcast episode and they were great - I'm now subscribed to everything! He was really nice, and working super-hard on behalf of Czech Game Edition to demonstrate all their latest games, including Codenames Pictures. 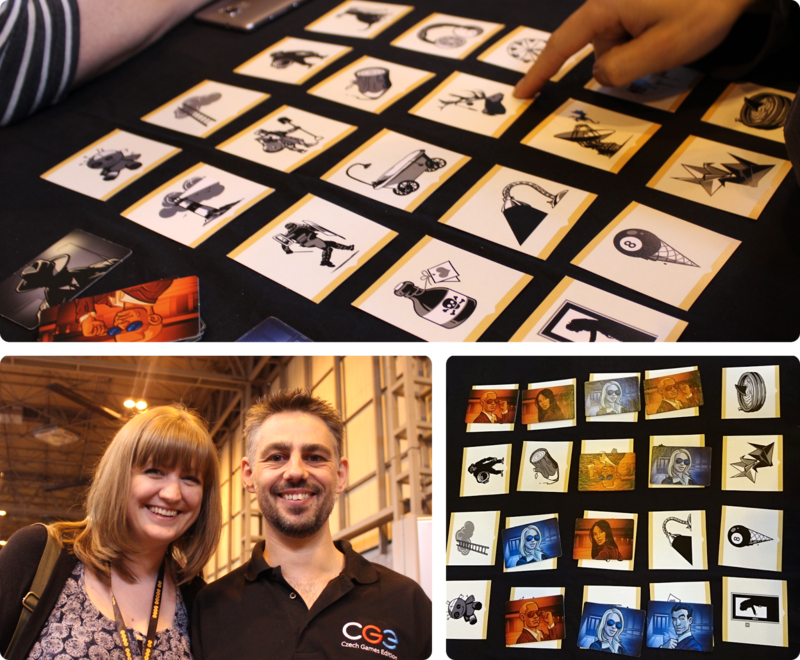 The original Codenames is a big favourite of mine, as you may have seen in my recent post, so I was really interested to see what they'd done for the Pictures edition and I wasn't disappointed. Codenames Pictures plays just like its predecessor but instead of linking words, you're trying to link pictures (on a slightly smaller grid). When I first heard about the game, I had imagined these pictures would be fairly plain, simple drawings - ladder, ice-cream, shark, for instance - but they are a little bit more Dixit-ey than that, giving you a much wider scope for clue giving. The ladder is propped up on a cloud, the ice-cream is a melting 8-ball on a cone, the shark is in a paddling pool. Lots more to work with when coming up with your clues! I really loved this game and will definitely be trying to get a copy when it's available later this year. I'd even go so far as to say that I like it better than the original word-based version, although I think it has a different enough appeal to warrant owning both, so I won't have to choose. You couldn't walk into the Expo hall without noticing that there was a big grey double-decker bus parked in the middle of it. This was home to Wotan Games and was a *genius* idea for providing instant play-space. 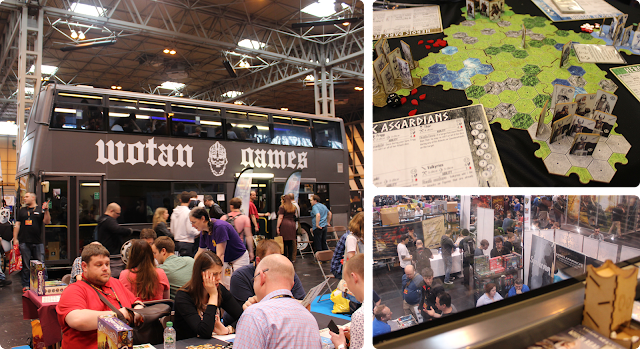 The whole top deck was converted to house little booths where you could try out their games with a great view of the Expo, so we wedged ourselves up the stairs with bags of board games to try out a prototype of War of the 9 Realms, coming to Kickstarter later this year. War of the 9 Realms is a tactical skirmish-style board game with a Norse mythology theme where players fight for control of Midgard. Players move using an action point system and combat uses dice, with a hand of modifier cards available to use as needed. Sadly, after a couple of turns we realised this wasn't really our sort of game and gave up our seats to make room for others to try. I love the Norse theme, but if I'm playing this type of game I want a big table, a tape measure and scenery to paint! I'd also need to learn all the characters' special abilities to get the most out of it, which is tough to do (for me) in a demo situation where you're already struggling with the basic rules. There were lots of people on the bus having fun with the game though, so if you're in the market for a nice compact skirmish game keep your eye out for the Kickstarter campaign! After a bit more wandering in the hall, we headed over to watch the live recording of a Dice Tower podcast. Sadly, by the time we got to the seminar area the queue reached most of the way across the hall and there was no way we were going to get in. I've since listened to the recording instead, but it's not quite the same! We missed out on a second Shut Up & Sit Down podcast the same way later that day, too. Next time I'll know to queue earlier! Aside from playing games, the Expo is also a really great chance to put faces to names. I got to meet Tim from Esdevium Games and interrupted his busy day to make him pose for a picture. Somehow he still managed to be hard at work promoting the distributor's shiniest new games, getting Pandemic: Reign of Cthulhu into the background! More on that game later, when we finally managed to get a seat at the demo table on Sunday. We thought we'd have dinner early so we could easily get a table for open gaming, but when we got back into the hotel it was jam packed! Clearly everyone else had had a similar idea... Hilton and Expo staff were busily prepping new rooms for gaming and in the end it was so busy that they'd put tables up in the lift lobby! We were kindly offered table space by some gamers in need of new things to play, and joined them for some Pandemic: Contagion, Mysterium, and a print-and-play version of recently Kickstarted social deduction game Secret Hitler (which I hadn't realised has Max Temkin of Cards Against Humanity fame on the design team). I loved murder mystery game Mysterium the most - there's lots to say about that so I think I'll save that for a separate post, but I'm so pleased I picked up a copy of this beautiful game. So that was Saturday and an awesome end to day 2 of the UK Games Expo. Come back soon to see what we got up to on Sunday! 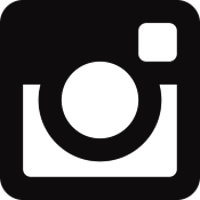 If you enjoyed this post perhaps you could take a look at my Facebook page and leave a like or come and say hello on my Instagram feed.